Happy Saturday, fellow crafters! Julie here today from Muddy Paws & Inky Fingers. 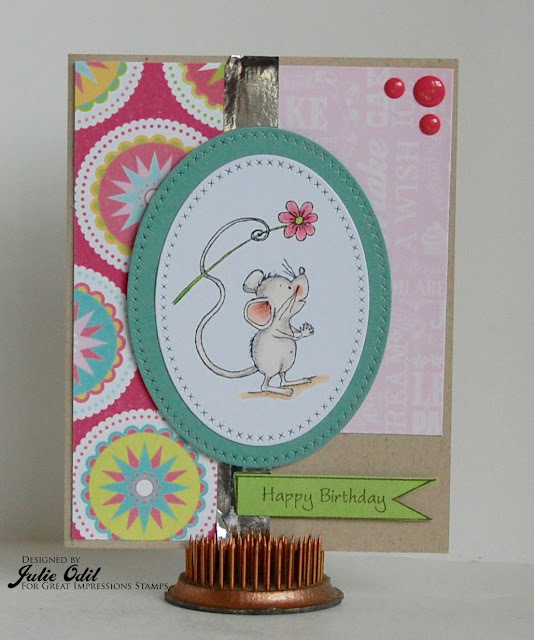 This card uses E838 Mouse With Flower and G483 Tags rubber stamp. I colored the Mouse With Flower with Copic markers. 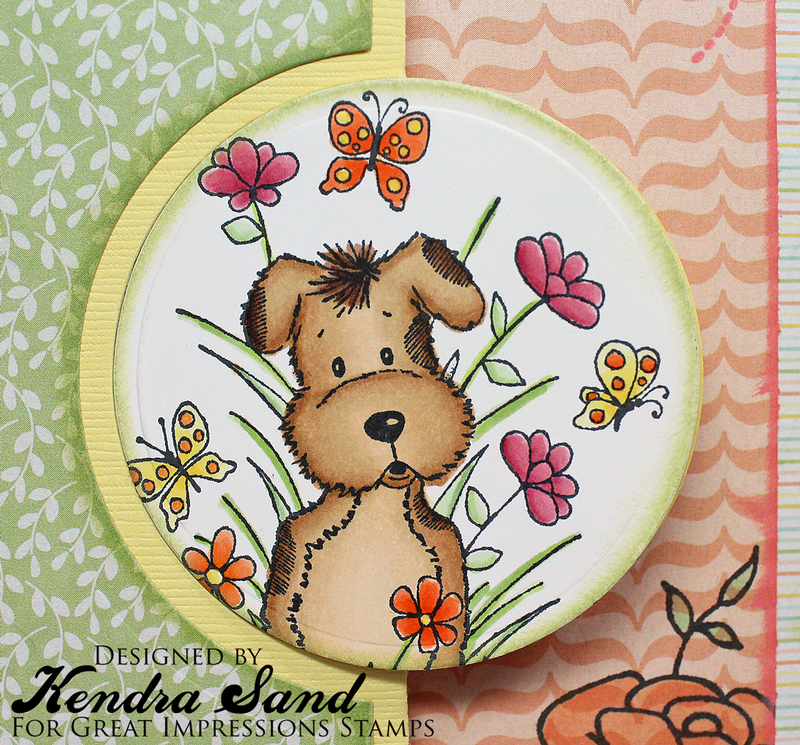 The Tags rubber stamp is a set of 4 tags. I cut them apart, using just one of them on this card. There'll be a new challenge starting tomorrow -- come join the fun! Don't forget to do some shopping at the Great Impressions Store! For my main image I used the adorable Peeking Puppy (H264)!! 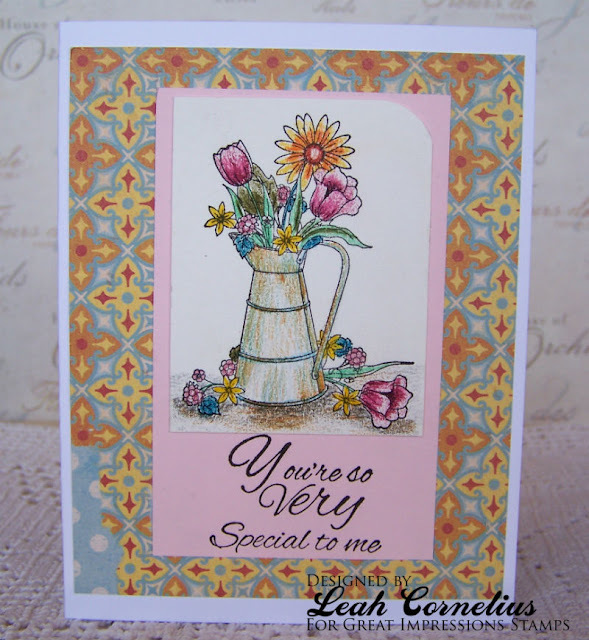 I stamped the Flower Bouquet (J110) on the pretty designer paper and then used my Copics to add color to the image. Just to make it stamp out a little more. I also stamped one of the butterflies from the Butterflies and Hearts (E563) stamp on the upper part of the same pattern paper, but this time with a similar ink color to the paper, as I wanted the butterfly to kind of blend it! Good morning! 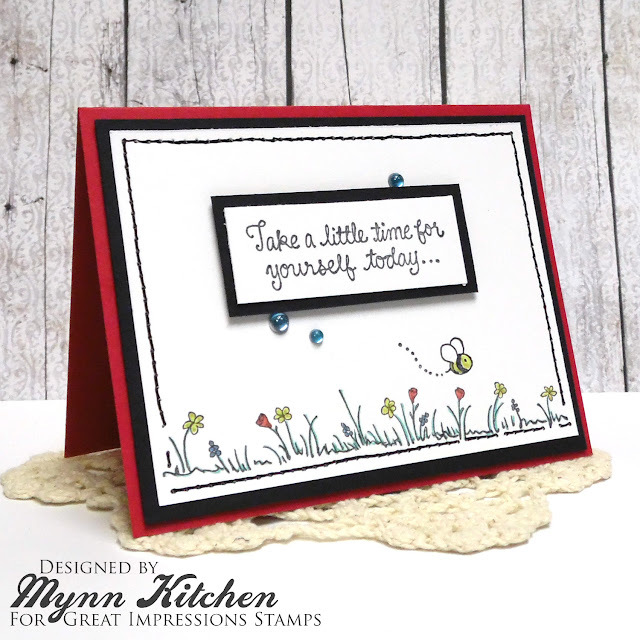 Ruza here to share a Mother's Day card featuring the F440 Spring Tea Cups and B190 Mother's Day Sentiment, available at the Great Impressions Stamps. 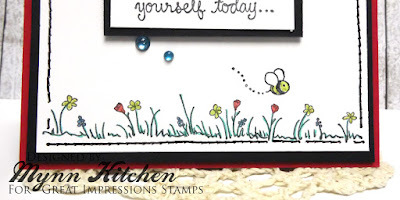 I stamped the Spring Tea Cups on Watercolor Paper with Ranger Jet Black Archival Ink then commenced with watercoloring the image with my Marvy LePlume Markers, pallet, paintbrush and water. Once complete, I fussy cut the image out and layered it on the background I created with 3D Foam Tape. 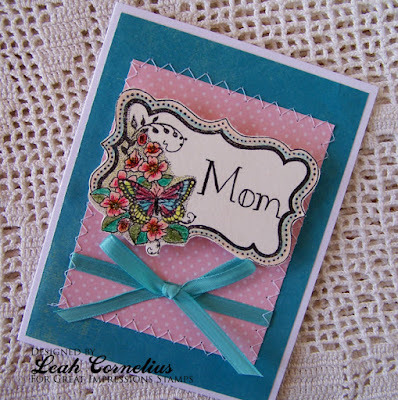 I stamped the Mother's Day Sentiment on the tag, colored in the flowers to match those on the Spring Tea Cups and used my Tiny Attacher to staple the sentiment in place. After adding a bit of Lilac Twine I attached the whole panel to my card base, and then stamped part of the Spring Tea Cups on a coordinating envelope. 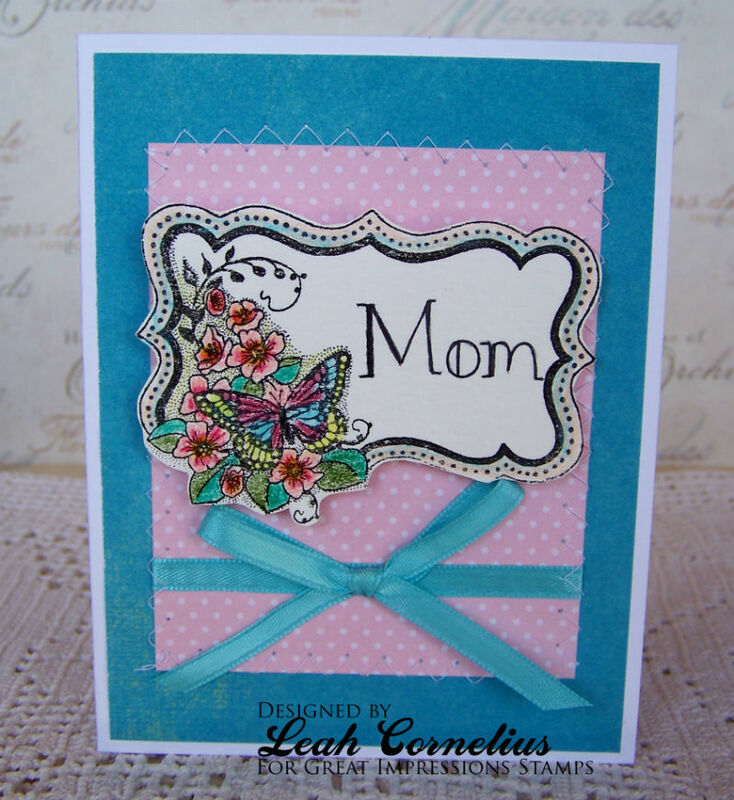 Leah here and today I have a pretty card to share with you that would be perfect for your mom or someone who has been like a mom to you. This pretty frame image is called (H226) Butterfly Frame and I colored it with colored pencils and then trimmed it out. The sentiment I hand lettered. I added some machine stitching and ribbon to finish it off with a bow. Good morning and welcome back to Tuesday with Lorie! Today I have a sunshiny birthday card for you that is sure to make you smile! It was also a very beautiful sunshiny day when I took the photo...love that! 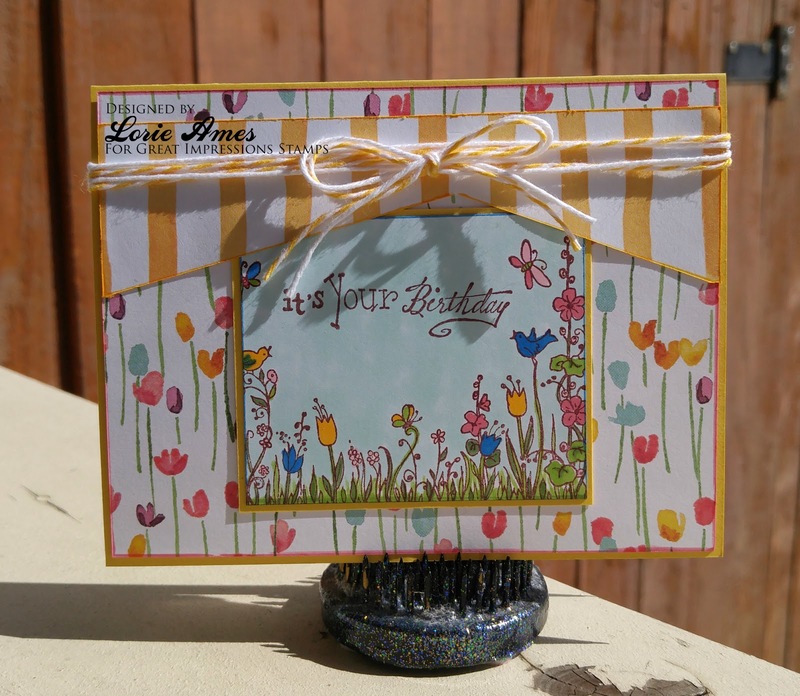 This cheery card uses the following Great Impressions Stamps: It's Your Birthday C458 and Spring Floral Border H228. The patterned papers are from SU! and again, I happen to have some lovely yellow twine in my stash that matches so well and puts a perfect finish on the card...love it when that happens! 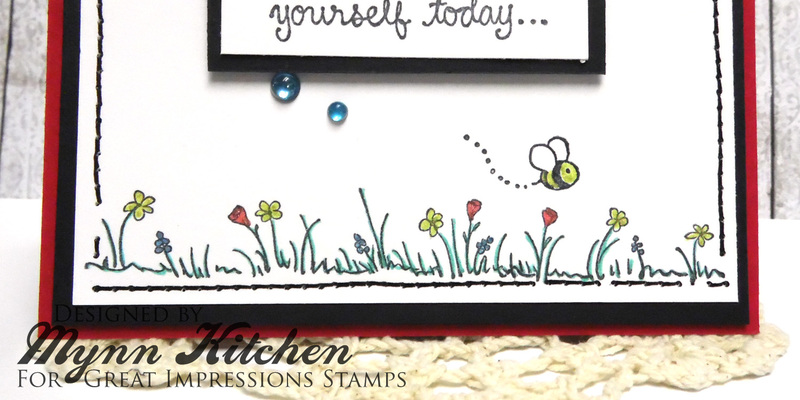 I used F496 Meadow Border and A55 Bee to create a fun springtime scene at the bottom of my focal panel. 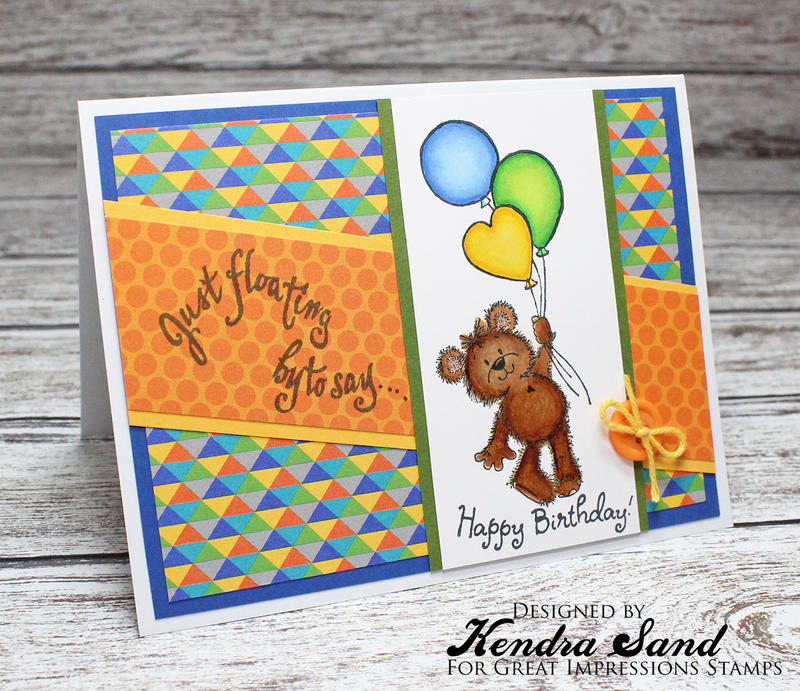 I colored the images in with glitter gels pens, then added a faux stitched border. 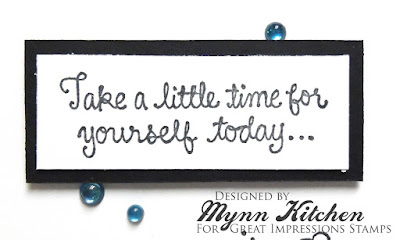 The sentiment is D466 Time for Yourself. I stamped it, matted it, then added it to the focal panel with dimensional foam. A few blue glass bubbles were added for a bit more finish. I think this is super fun and fresh! What do you think? I would love for you to let me know by leaving a comment below! 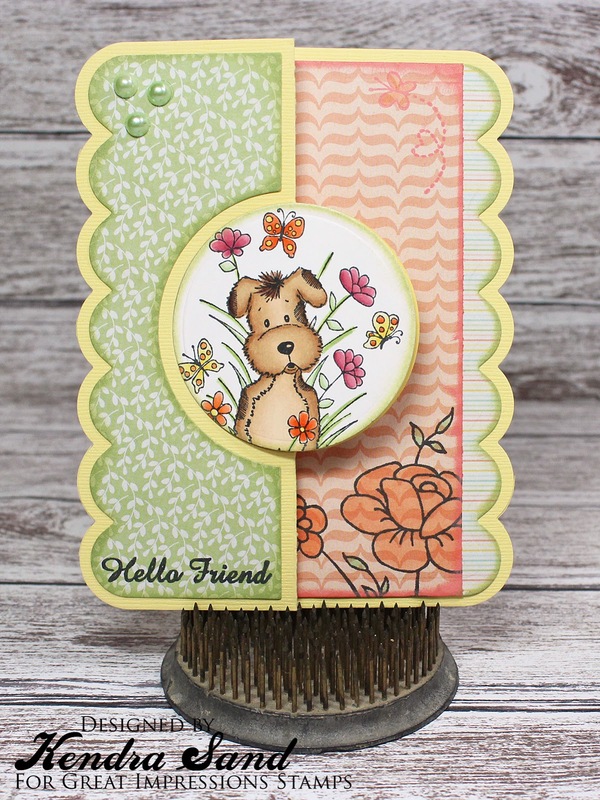 Happy Spring, fellow stamp lovers! Julie's with you today. Spring brings much rain where I live. Why not have a cute umbrella? 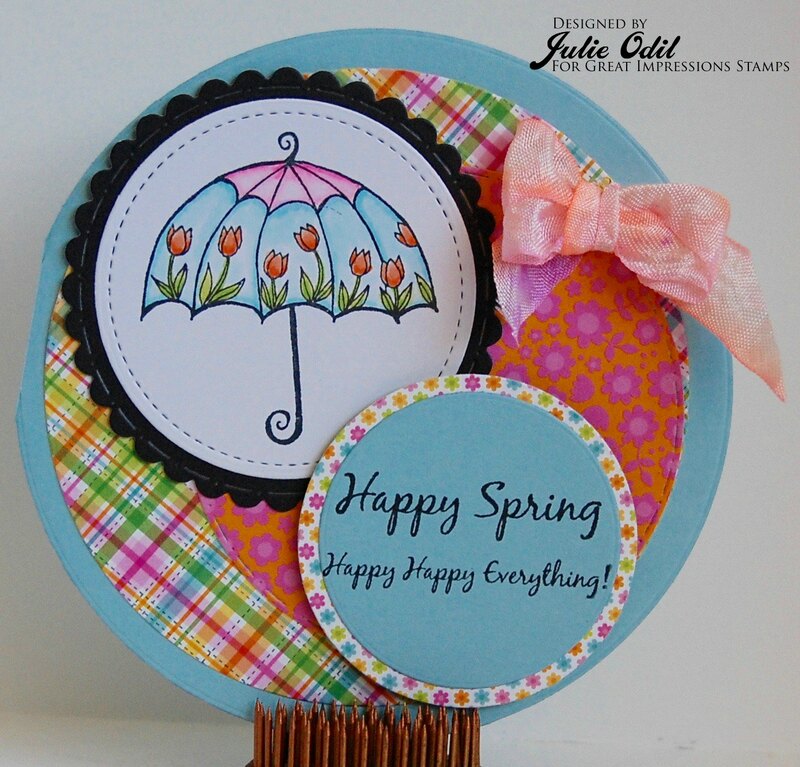 This fun card uses F480 Tulip Umbrella and B246 Happy Everything. I colored Tulip Umbrella with Copic markers to give it a bit of depth. Have you entered the monthly challenge? This month's theme is Ladies Night. It goes all month, so there's still time. If you use a Great Impressions Stamp, link it to the Great Impressions Customer Gallery. We'd love to see what you create! 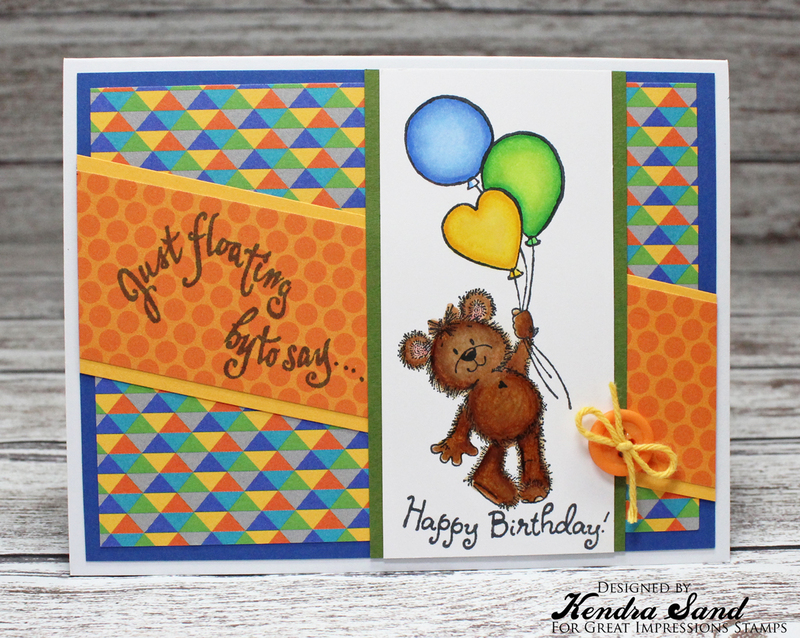 For my card today, I decided to use the adorable Bear Floating By (G521) stamp! Such a cute stamp for a kids birthday card!! I also used the Just Floating (E648) sentiment, but masked the end of it so the "hi" wouldn't stamp. Added a few dots behind it and then stamped the Sweet Happy Birthday (B240) under the bear!! 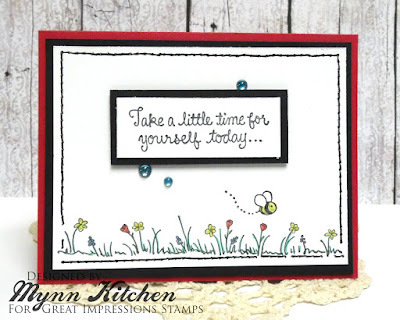 What a fun way to change up the sentiment!! Good morning! 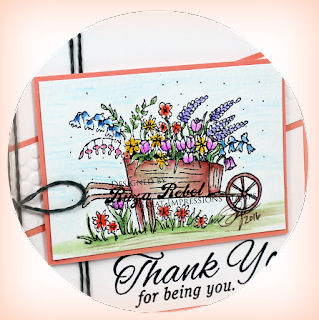 Ruza here to share a Thank you card featuring the F49 Flower Cart and D509 Being You Sentiment, available at the Great Impressions Stamps. When I saw that the Flower Cart was recently brought out of retirement for a limited time (see top of sidebar) I knew I just had to have this beauty. 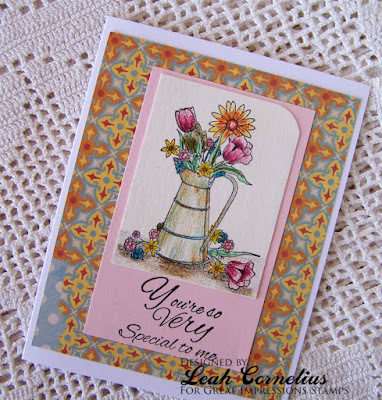 I paired it up with the Being You Sentiment. I stamped the Flower Cart on Ranger Watercolor Paper with Ranger Jet Black Archival Ink then commenced with watercoloring the image with my Marvy LePlume Markers, pallet, paintbrush and water. Once complete, I added the Coral Panel behind the colored image, and layered it on the background I created with 3D Foam Tape. Hello! 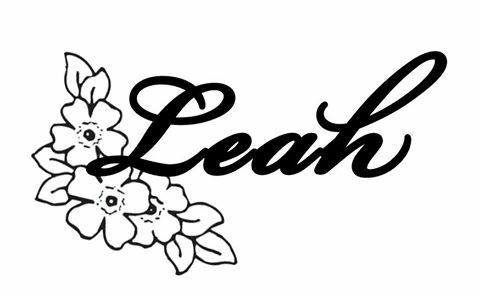 Leah here. 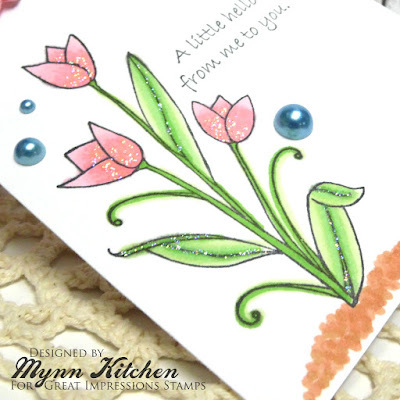 Today I have a card for you using some Great Impressions stamps. This is such a pretty image and I wanted to used my colored pencils to color it in. 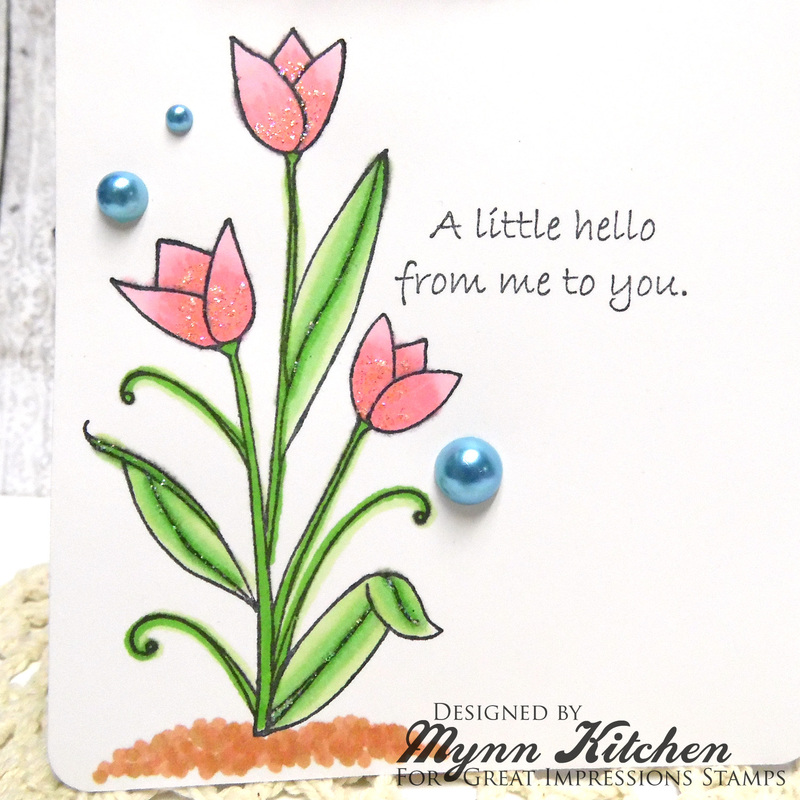 I stamped it onto watercolor paper as that gives the colored pencil more tooth to hold on to and I didn't try to blend it out. I think letting the medium shine through in texture is nice too. The image is called( G302) Watering Can and the sentiment is (D500) So Very Special. My card today is made with the cute stamp Fun Coffee Cup H278. As you can see I paper pieced the cup with a complimentary, fun, patterned paper, the whipped cream at the top has clear glaze as well as well as clear star gelly roll pen on it...so cute, wish I could have gotten a better photo for you. 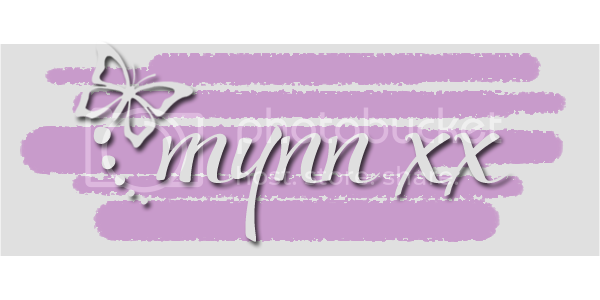 I had the perfect twine colors on hand to draw this all together! I've also used a base of CutCardStock's brown paper bag precut card base which is a great finish to this card! 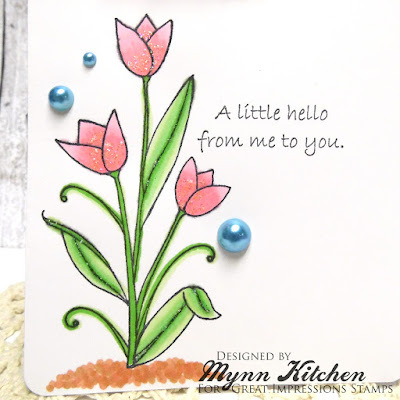 I haven't made a lot of one layer cards recently, so I decided to make one using H251 Tall Tulips and B151 A Little Hello. I colored the image with Spectrum Noir markers, added some glitter, and threw a few blue pearls onto the card to represent "sky". 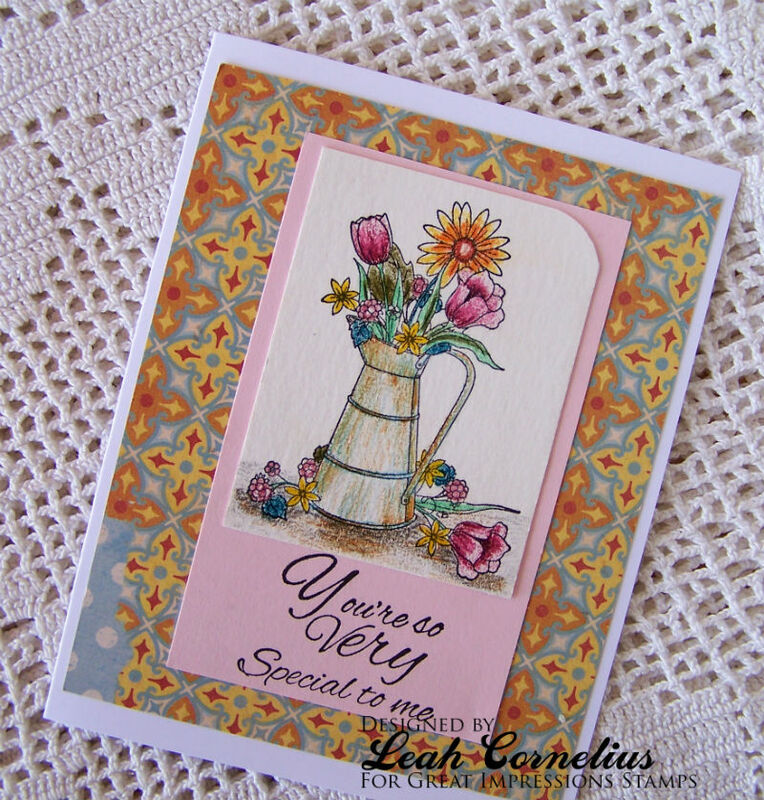 The top was gussied up with some pink gingham ribbon--I LOVE the way this pattern looks with this image! I am very pleased with how this creation turned out, and I hope you like it, too! I would love for you to leave me a comment below and let me know what you think! Happy weekend, everyone! Julie here today. We're finally making some progress on Springtime here in NW Wisconsin. Some warm days are bringing green grass and our first flowers of spring. Daffodils are beginning to bloom. 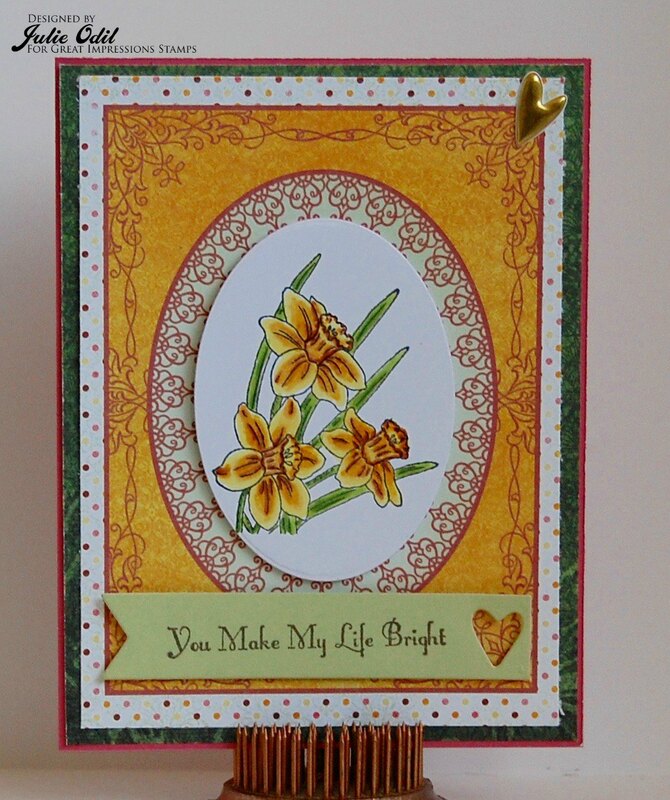 This is Great Impressions Stickable F475 Daffodil. I colored the Daffodil Trio with Copic markers. 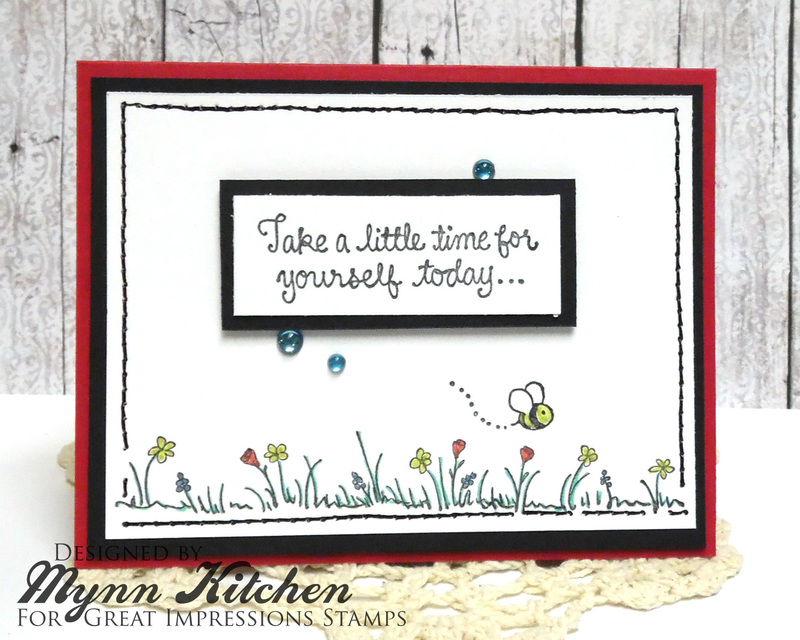 The sentiment is D399 My Life, stamped with Cocoa ink. Papers on this card are from Heartfelt Creations. Have you entered the monthly challenge? This month's theme is Ladies Night. It goes all month, so there's plenty of time. 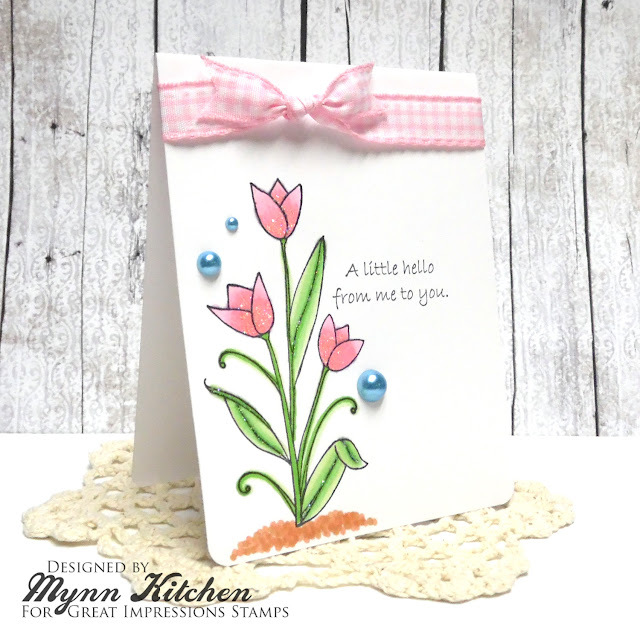 If you use a Great Impressions Stamp, link it to the Great Impressions Customer Gallery. I'd love to see what you create! 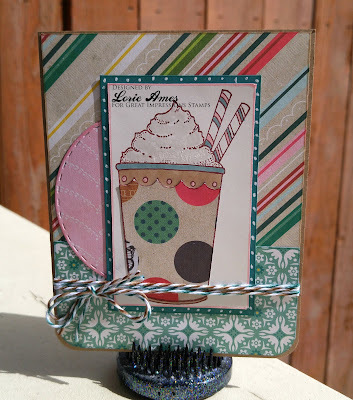 Kendra from Luv 2 Scrap 'n Make Cards here today to share another fun card with you!! 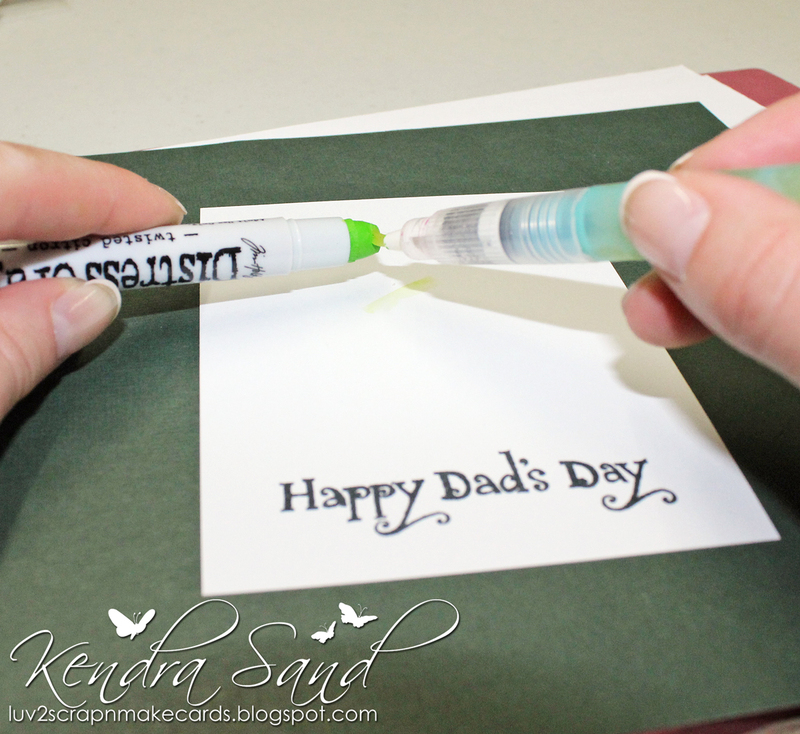 I thought I would get a head start on some Father's Day cards!! I really like the Happy Dad's Day (D389) sentiment from GI! 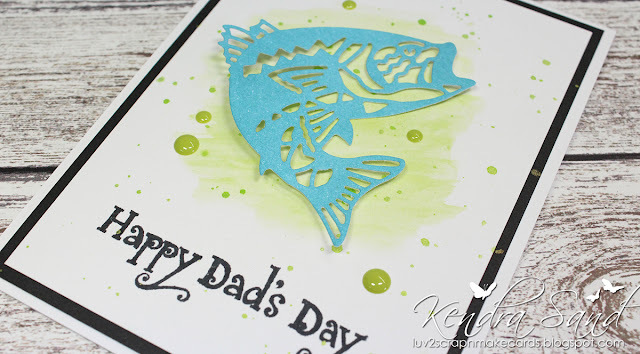 Something different, then the traditional Happy Father's Day sentiments! 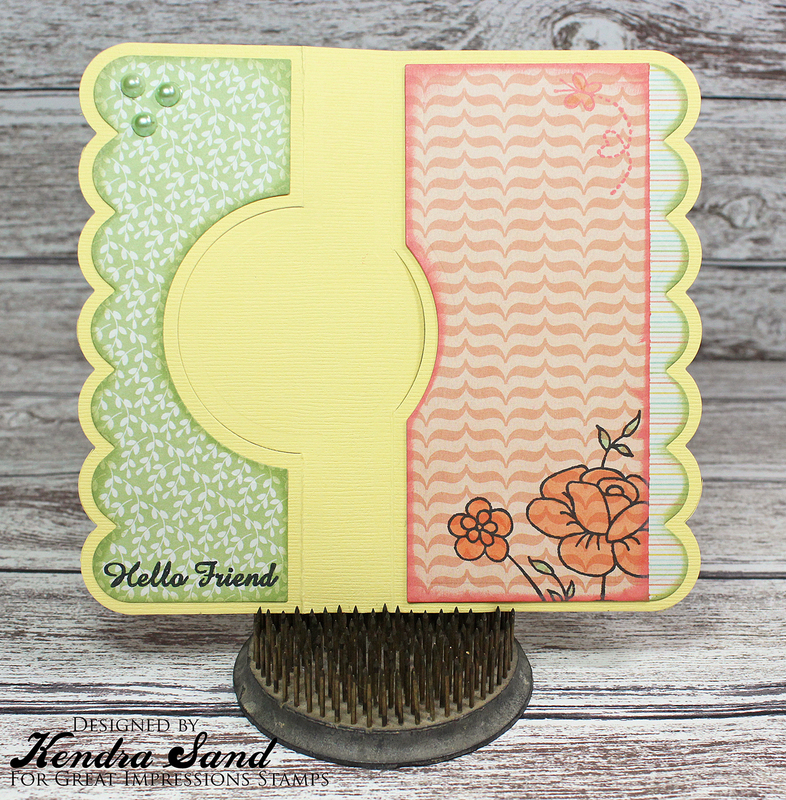 So I decided to focus on that sentiment along with a fun new fish die I recently got! 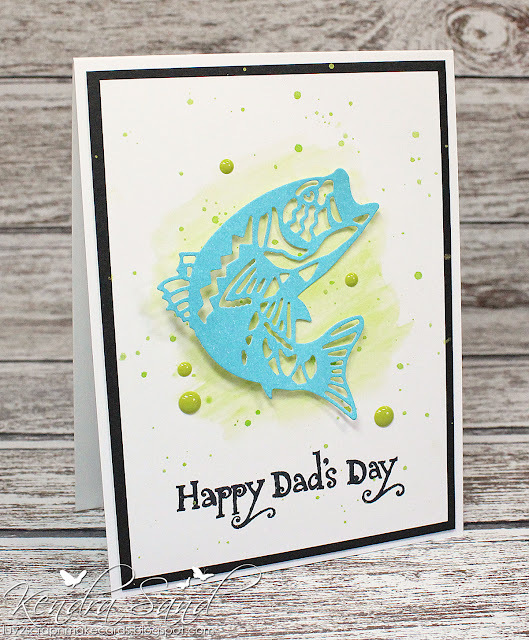 I started by first stamping the sentiment, then I thought I would use my Distress Crayons to create a light wash that I would then put my die cut fish above. I used my waterbrush to grab the color from the crayon and then lightly created the wash on my paper. Before adding the fish, I also added a few ink splatters! I really like the light wash behind the fish. 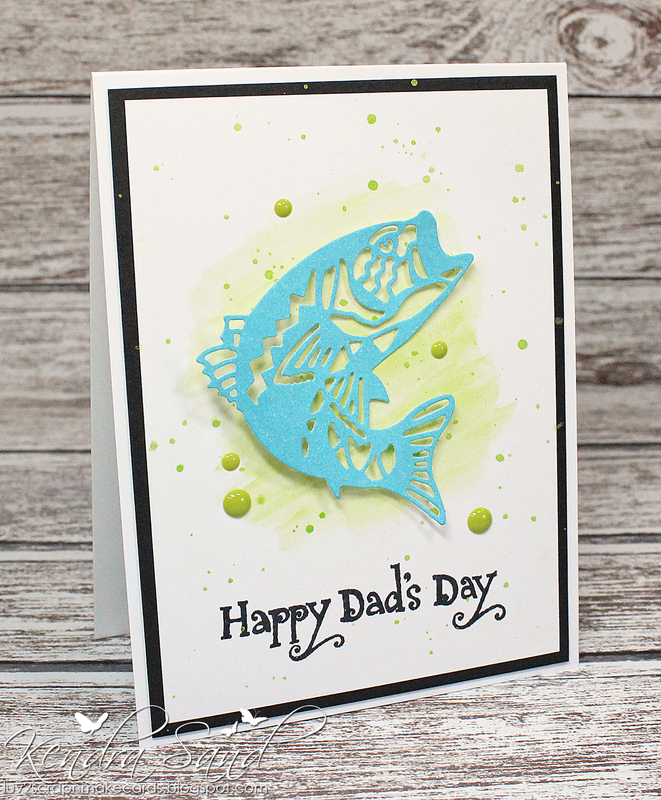 Perfect, simple card for a special dad!! Good morning! 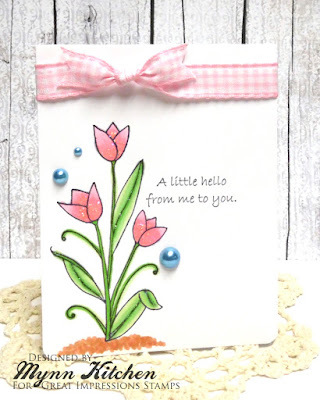 Ruza here to share a Mother's Day card featuring the G405 Butterfly Flourish and B190 Happy Mother's Day, available at the Great Impressions Stamps. The Butterfly Flourish and Happy Mother's Day Sentiment were inked up with Archival Jet Black Ink. Marvy Watercolor Markers were used to color the butterflies and swirls, and the background color. Using a .05 Copic Multi-Liner Black Pen I add the lines 1/4" from the edge on three sides of the panel, added black enamel dots to three of the corners, and used 3D Foam Tape to attach my panel to the cardbase.